Probably one of my favorite TV programs when I was growing up was the show Mission Impossible with Peter Graves in it. I can always remember the phrase 'Your mission, should you choose to accept it is....”. Well most of you know or are aware of the latest movie Mission Impossible movie that is now out starring Tom Cruise. Microsoft has joined forces and as a way to celebrate the movie release, they have released a pretty neat Windows 7 theme with the mission to add some spice to the plain old desktops. In the theme pack, there are four wallpapers all high-resolution. The wallpapers feature Tom Cruise who plays the character of Ethan Hunt. There are also other characters in different scenes from the movie. Microsoft suggests that “...your mission, should you choose to accept it, is to download the free Windows 7 theme and get a glimpse of the action and adventure that you can expect in the film. For those that haven't seen the film, you should take the time to go see the film. It is good and if you are into action movies, you will enjoy it. It is directed by Brad Bird. It has been given a score of 7.8 on IMDB. It is important to note that when you download the Windows 7 theme pack that you can only use it on the Home Premium Edition, the Professional Edition, the Enterprise Edition and the Ultimate Edition. It will not work on the Starter Edition. Of course if you have the Starter Edition, you are probably already aware of the fact that in order to modify or change the desktop background, you have to have some type of third-party software to make that happen. 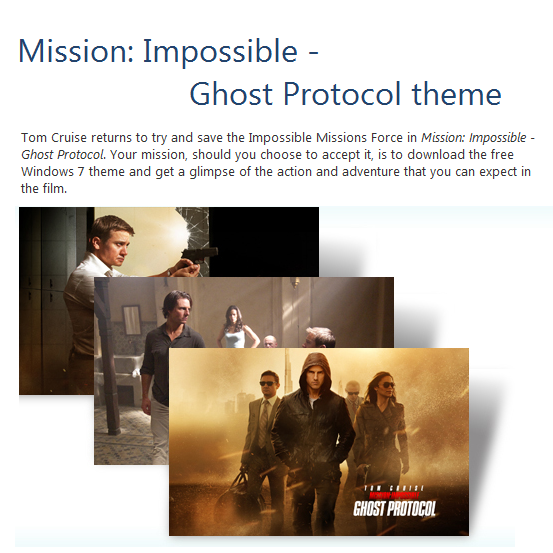 So for all Mission Impossible fans or even Tom Cruise fans and are running Windows 7 on your desktop, go ahead and download the theme pack. To get it to install, all you have to do is to double-click on the file and it will go ahead and install. 0 Respones to "Official Mission Impossible 4: Ghost Protocol Theme for Windows 7"